You’re going out of town and your to-do list is a mile long. Booking the most direct flight, making reservations at your favorite hotel, packing that new outfit you just bought, finding coverage for work so you don’t return to a mess. All of these preparations will make your trip more comfortable and give you peace of mind while you’re away. But what about your pet? If you’re kenneling your animal during your trip, you might put scheduling their stay as one more item of your list and leave it at that. But doesn’t your furry friend deserve the same kind of preparation you’re taking for your absence? Leaving home to be cared for by strangers can be a scary experience for pets, and they aren’t capable of preparing themselves for their stay. They rely on their favorite human for that. There are two main concerns when kenneling a pet for the first time: how they’ll react to being parted from you and how well they’ll be cared for by the kennel employees. With a little preparation, you can help both your pet feel more comfortable in a strange place and its caregivers know how best to care for your pet. First, tour your kennel of choice and take your pet with you if possible. Learn how the facility is run, what kind of environment pets are kept in and if their level of care is adequate for your fur ball. Bring a list of questions with you, such as are there restrictions on age or size that might apply to your animal, how much exercise they get and if food is provided. Also ask about what preparation they need from you, such as providing personal food, toys, etc. for your pet. 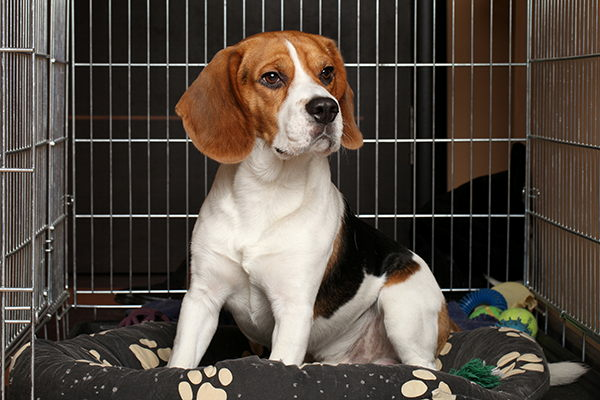 Once you’re satisfied with the kennel you’ve chosen, it’s time to prep your pet. Start at the veterinarian. All animals being kenneled must be up-to-date with their vaccinations, so ensure your pet’s vaccinations are. Also treat any case of fleas, illness or injury immediately in the time leading up to your absence, so you’re not leaving a sick pet with strangers (if they will take it in its condition). Next, familiarize your pet with the kennel. If you can’t take them into the kennel for visits, at least drive to the kennel a few times and walk around it so they become familiar with the process. This helps minimize the anxiety of the unknown for them. Additionally, you could book a short preliminary stay for your pet, such as boarding them one night or taking advantage of the kennel’s daycare service if they have one. This will also help the staff get to know your pet and assess any difficulties they foresee with a longer stay. When it comes to preparing the staff to care for your fur baby, remember they are the professionals. However, they will appreciate knowing about any unique habits or fears your pet has so they know how best to handle them. Also, notify them of any special dietary or medicinal needs. You will need to fill out paperwork when you book your pet’s stay, so do so thoroughly and honestly for everyone’s sake. If you are unsure of anything related to your pets’ stay, feel free to contact the kennel and ask for more information or advice. They care for pets just like yours every day and have seen it all. If they are a good kennel, they’ll be able to give you helpful tips for preparing your furry friend for its stay and will have plenty of tricks up their sleeves to help the eventual parting go smoother. It can be scary for both you and your beloved pet when you have to leave them with strangers, but putting as much preparation into your pet’s stay as you have for your own trip will help both of you feel more at ease until you can be reunited again. Looking for the best kennel for your pets? Board them with Academy Animal Hospital. We offer daily, weekly, and extended stay boarding for cats and dogs where we give them lots of individual attention and care. Call today to learn more.